The EIFFEL support action has been designed to mobilize European researchers to discuss and debate the future of the Internet, thereby helping to develop a functional networked society for the future. Within the 7th Framework Programme, the EIFFEL specific support action (SSA) was created from the need to assemble recognized contributors to perform research on the future Internet in retreat-like meetings. As the project plan states: "
[the EIFFEL group] recommended that the best possible 'minds' (people) should be mobilized and motivated to establish European visions and to ensure proper interaction and debate to make the different vision trajectories meet in the future networked society." Figure 1: Need for Debate: A balanced approach. EIFFEL will therefore gather international experts with the goal of developing visions for the future Internet. These meetings take place outside given funding structures: based on peer recognition the think tank members are invited to generously donate their time and knowledge. At the time of writing, the second of these think tank meetings had just finished, with some 25 external experts gathering in London in February 2009. To ensure lively debate and brainstorming, the number of participants at each meeting is kept relatively small. The invited members vary slightly, although it is intended that the EIFFEL community should gradually grow. The EIFFEL SSA is not the only initiative to undertake debate on the future Internet. Many European initiatives have been created over the past few years, most notably the Future Internet Assembly, as have initiatives in other regions of the world. The US initiatives on FIND (Future Internet Design) and GENI (Global Environment for Network Innovations) even precede European efforts like EIFFEL. For this reason, EIFFEL is attempting to attract a global audience, with international members being part of its think tank. Recognizing the need for debate is a relatively easy step compared to defining the subject of debate. It seems obvious that an increased understanding of what we can commonly agree on should be the outcome; this was identified during the first two EIFFEL think tank meetings. But what is it that the community can agree on? 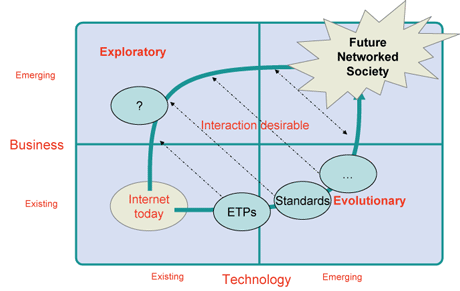 Is it approaches for solutions towards the future Internet? Or common principles for a future architecture? All this is clearly desirable, but is the community at a stage where it can fulfill such demanding goals? In order to agree on approaches that will be central to the future Internet, we as a community need to identify the contentious areas of investigation. Hence, we need to 'agree on the disagreements', which will lead us to the (potentially) necessary further investigation and debate around these disagreements. This debate will need to evaluate relevant solutions, hopefully paving the way for a growing set of agreements that could form the foundation for the future Internet. The London think tank meeting saw the beginning of this debate, with presentations as well as break-out groups in areas like trust and security (David Clark), measurements required for future Internet research (Kimberly Claffy), the issue of inherent (social and moral) values for the future Internet (Ian Brown), and the operational viewpoints of a large data centre provider (Vijay Gillis). Pinpointing disagreements involves resolving contentions in some areas as much as formulating them in others. In other words, compiling a set of disagreements is more than merely listing every pet research topic and vision. We must determine why further dialogue is important, and this involves formulating potentially conflicting viewpoints on the importance of particular areas to the design of the future Internet. This does not oppose Alan Kay's view that "the best way to predict the future is to invent it", but complements it with the necessary debate on why that future is worthwhile pursuing. Individuals must therefore approach the meetings ready to discuss and even defend their viewpoints with respect to the importance of the topics at hand. There must also be a component of community contribution, building on and recognizing the collective intelligence of the wider community. Overall, contributions to this debate, its disagreements and its potentially controversial viewpoints need to come from a community of researchers that feels strongly about the importance and relevance of its work to the future Internet. However, some form of editorial steering of the debate is also necessary. This will help consolidate debate in areas where consensus is beginning to emerge, while fostering and moderating it in areas where disagreement prevails. Careful consideration of these issues has led us to consider a Wikipedia-like online platform as the first step for this debate. This platform is charged with gathering opinions and consolidating the debate of a growing community of researchers, and will be a repository for relevant work in areas that are critical to the making of the future Internet. The platform will most importantly serve as a tool with which to formulate, debate and finally resolve disagreements. The use of collaborative editing tools like wikis will allow this debate to be recorded and structured. It is important to note that this online platform will differ from a conventional Wikipedia-like encyclopedia in having a clearly defined editorial team, soliciting contributions from identified (registered) users (while being open to be read by anybody), and allowing individual contributors to retain the copyright of their contributions. At the time of writing, an initial team is in the process of setting up such a platform. It is expected to launch during the spring of 2009, seeded with results from the initial EIFFEL think tank meetings but also incorporating material from experts worldwide. While a particular timeframe will not be enforced, we do expect the debate to pick up quickly, leading to early results. The positions presented in this paper are the outcome of discussions among EIFFEL think tank members and therefore includes the viewpoints of many individuals involved in these discussions.